The Elite i20 from Hyundai is a great premium hatchback. It has a great set of engines and continues to look great to this day, even though it has been on sale for some years now. With that said, though, can you imagine this car looking like a Ford Mustang? Well, today we bring to you a story on Hyundai Elite i20 modified to Ford Mustang. 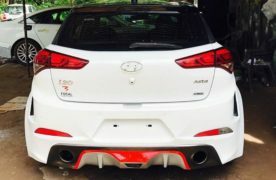 Many people in India are quite obsessed with modifying their cars, going as far as changing the entire look of the car. 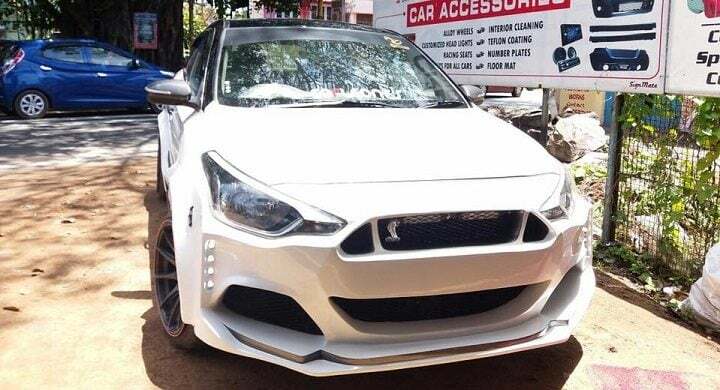 This Hyundai Elite i20 modified to Ford Mustang is one such example. Keep reading to know more about this car. The stock Elite i20 sports a great (although flamboyant) design. This modified car does not tinker with that. Instead what it does is tinker with some styling bits of the car. 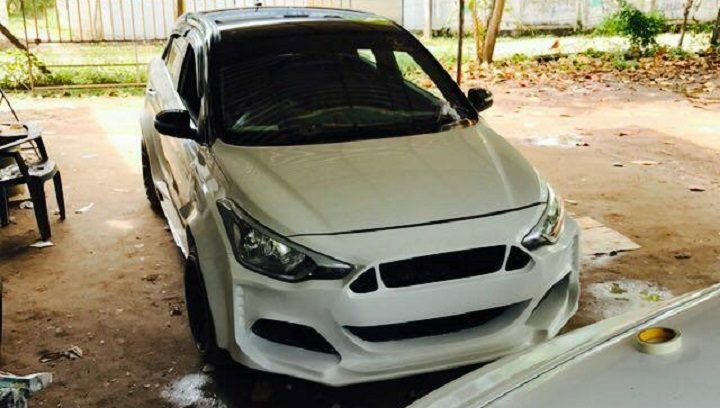 So, this car sports a body kit. This means it has a different front bumper than the stock car. It has a trapezoidal cut-out for the grille, which is divided into three sections. Below it is cut-outs for the air dam (center) and air intakes (on either side). Below the headlamps. on either extreme end of the front bumper, sit LED DRLs in a vertical position. With all the changes made to the front bumper, the stock headlights have been retained. Moving to the side, the use of the body kit has led to a protrusion of the car’s wheel arches. The car’s pillars have been blacked out and the mirrors have blacked-out housing. The alloy wheels carry a different multi-spoke design than stock wheels. Then there is the skirt below the doors as a part of the body kit which has a cut-out where it meets the rear wheel’s arch on either side. At the rear, the taillamps get blacked-out outlining. The rear bumper has a faux slit on either side. There are two exhaust tail pipes in the bumper, one on either side. Between the two tail pipes sits the faux diffuser. The modification to this Elite i20 bestows it with a number of features. Looking at the car, it looks like it is a pre-2017 model as the new model comes with projector headlamps with integrated LED DRLs. The car’s body kit does give it a mean look and it also has a new after-market audio system. 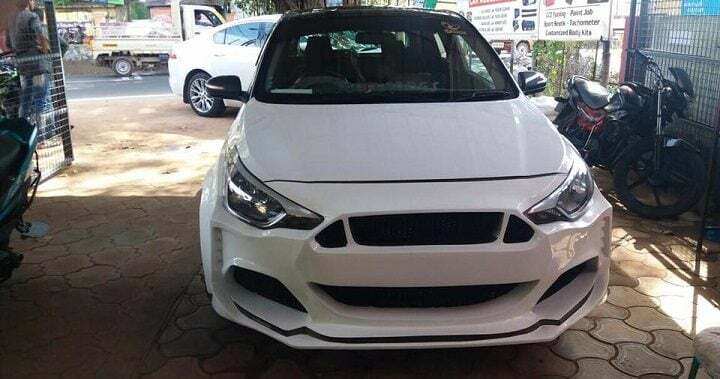 Other features added to this car include a sunroof, new design alloy wheels which are bigger than stock ones, twin exhaust tailpipes, a faux diffuser at the rear and blacked out A, B and C pillars for dual-tone exterior paint finish. The above prices are the ex-showroom prices of the stock Hyundai Elite i20. 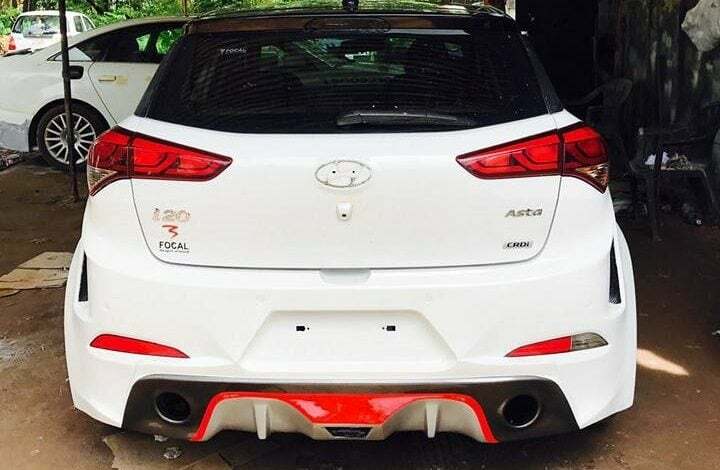 We don’t know how much has been spent on this car, but our ballpark estimate is that north of Rs 3.00 lakh is the likely spend on modifying the car. After all, the modifications are not limited to the exterior only, with the car getting a new audio system too. Since no photos of the interior are available, we don’t know exactly how much the interior has been modified. This car is likely to sport the stock Elite i20 diesel engine. In its stock form, the diesel engine displaces 1.4 liters and is a turbocharged unit. It makes peak power of 89BHP and peak torque of 220Nm. It comes mated to a six-speed manual gearbox. So, this is all about the Hyundai Elite i20 modified to Ford Mustang. We will keep this story updated with the car’s price, modification list and more as and when we get to know more about it. For more such stories, stay tuned to Car Blog India.